My feeling awful had been coming on for weeks. In my previous post, I wrote about what they suspected was wrong with me, but deep down in my gut – ha! – I knew it was something more serious. I had never ever felt this unwell in all my IBD life – coming up to five years since my diagnosis in September 2011 – and knew I needed help. I knew I had to go and pack a hospital bag. And I knew it would be for at least a couple days, if not longer. It was going to take time to get sorted. Little did I know how long I would actually spend in hospital this time and what I would go through. 8.10am and my IBD nurses are on the phone telling me to come to A&E to be admitted – they’ve found me a bed! I’m abit nervous; I know this wasn’t going to be a simple in-and-out-in-a-couple-days admission, it was likely to be a lengthy, painful process. But I was ready for it. It had to be better than what I was going through. My parents grabbed my hospital bag, the phone chargers and their reading books – waiting around was inevitable – and we all got in the car and drove to Good Hope. 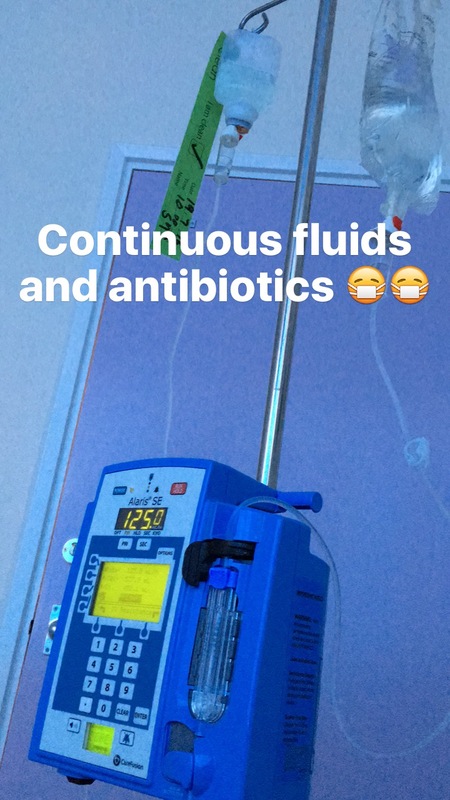 We spent a couple hours in A&E waiting to be seen by the usual doctors for an admission and not long after lunch, I was being moved to the Gastro ward. 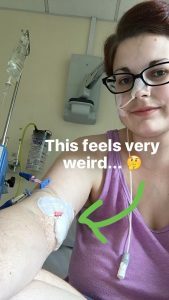 I’d already been put on fluids – dehydrated as always – had my bloods taken, given morphine and given my medical history including my new sensitivity to codeine. This didn’t make me a tricky patient but meant I was either going to have paracetamol and still have some pain or need morphine. The bed I was due to get was being deep cleaned so we had to wait even more. At this point, waiting didn’t seem like such a hard task; at least I was in the hospital and I was going to get sorted. If anything I was happy. You know the feeling – after being in pain for so long, some relief and a plan on where to go from there was a comfort. My consultant and IBD nurse came to see me to discuss a treatment plan. Despite the fact that both of them would be on annual leave until the end of August; it was agreed that I would have at least a week long stay for further tests. We needed to get to the bottom on all this pain and the sickness and lack of appetite. They suspected it was either free fluid in my abdomen which they would need to aspirate or it was a leak that might need an operation to fix. But first, I would start an aggressive triple dose of antibiotics for the week. Ward round on Monday morning; the first opportunity any doctor would have to decide on where to go next. My replacement GI and my surgeon agreed that I needed a colonoscopy and a MRI doing ASAP. Within in a couple hours, I was taken down to the Endoscopy for my scope. 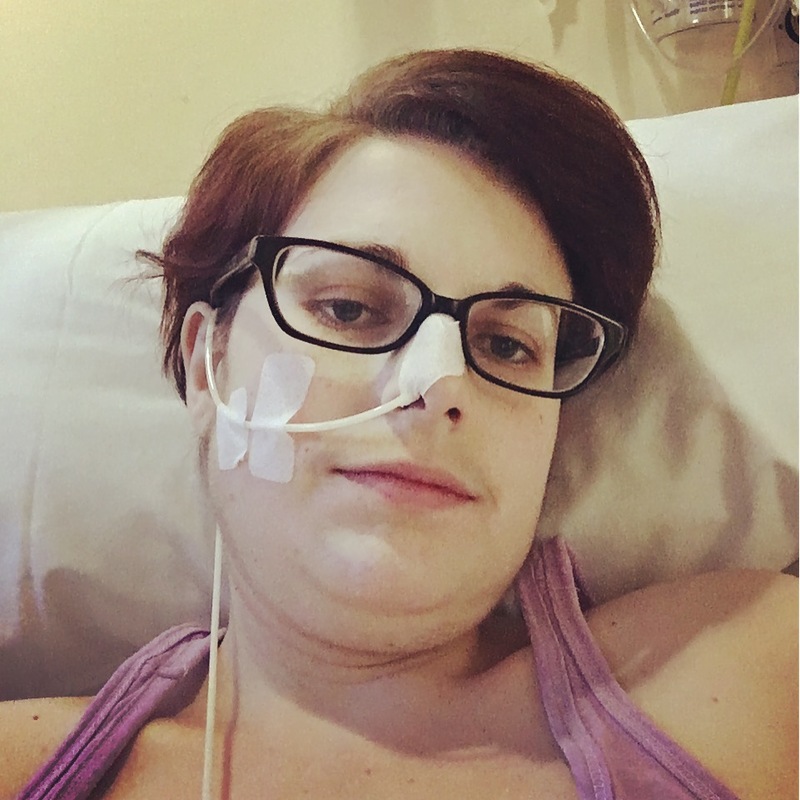 In between this, I had agreed to have a NG tube placed because I needed nutrition – after three failed attempts with the nurses, they would place one whilst I was sedated. I nervously sat on the gurney in the recovery ward, wondering what they would find. I hope it wasn’t too bad, like I do before every scope. But I knew having to have an emergency one done on a quite serious admission meant it probably wasn’t going to end well. I was probably going to have to start a new medication – maybe they would finally retrial Vedolizumab or even actually send me to Nottingham for something they had that Good Hope didn’t – or need another surgery. Surgery scared me. The last one didn’t work like we planned, would another one be the same? Wasn’t it too soon to reopen me? Would it hurt more? That’s what I was concerned me most. It feels foolish to admit that now. Once they took me through to the scoping suite, I had got myself worked up quite abit, so I was quickly sedated and they started. Soon after, they stopped. I didn’t feel a thing, but it was because they’d only got to my descending colon before deciding it was too diseased to continue. My colon was full of blood. Not only that, it was deeply ulcerated and utterly cobblestoned. Things were not looking good at all. What happened next was they placed the NG tube. I was still sedated from the colonoscopy so I don’t remember much but screaming. They performed a gastroscopy, checked my stomach – due to the level of sickness and amount of bile I had been bringing up – then added the tube. It was a horrible experience. They had to sedate me again because I was screaming so loud and tried to pull the tube and scope out of my mouth / nose. I wasn’t a happy bunny. The less said about the NG tube the better, but I will say this – I understand the principle behind needing one and why I needed one desperately but it is the most uncomfortable medical procedure (not the process but the actual tube!) I’ve had done. I had it in for eleven days – leading up to surgery and after – and whist I did get use to it, I was so overjoyed when it finally came out! Once back on the ward, they decided to feed me through the NG tube that afternoon with an elemental diet. I was hooked up to a 10ml / ph feed that evening but soon after, I was being sick again. Back to the nutrition drawing board. Meanwhile, I learnt the fate of my colon. It needed removing. All of it. And sooner rather than later. But I was too weak to survive a subtotal colectomy at this stage. Subtotal colectomy washed over me; didn’t that mean a ileostomy? A permanent one? I was confused; how could this have happened? Why was this happening? Was this really happening? 9am; my mom arrived for visiting to find out I was going to be MRI for my scan within the hour. My surgeon came around to explain he needed this scan to compare to my colonoscopy from yesterday. It felt like a bad dream. How was I going to do the bowel prep with an NG tube down my throat and feeling so sick? I was assured I could do the scan without it but then told I needed at least 100ml of it in my stomach to help the contrast dye work in the scanner. That 100ml was the worst 45 minutes of my life. I could only sip liquid so not only did I take ages to finish 100ml but it made me feel so physically sick too. I was still getting used to the NG tube which made every sip hurt. I remember thinking that this had to be the worst part of everything and I would get through it, like I had done with everything else. That lunchtime, we had a meeting with my surgeon, IBD nurse and GI. I could try Vedolizumab again but it has been known to only work in 25% of patients and takes several weeks to actually work. I also needed to be conscious of my lack of nutrition. I could opt for surgery and have my colon removed and a permanent ileostomy created. This could take place in a week’s time or slightly longer; depending on my nutrition. They suggested I be moved to the surgical ward to have a PICC line fitted and receive TPN feed until I was strong enough to essentially survive the surgery. Queue the emotions. Of course, deciding to have surgery is always a last resort for any IBD patient (or at least I hope it is!) so being there – at last resort – was shocking. I knew I was unwell but not by how much. My colon was described as being like hamburger meat; there was nothing salvageable there, this was my only option at returning to a good quality of life. Yes, it would mean having an ileostomy for the rest of my life – so much time, so definite and permanent – but it would dramatically improve my QoL. This was not a decision to be taken lightly. I was advised to take a few days to think about it before making a definite decision. In the meantime, I would move wards and get my line and start TPN. Even if I decided against surgery, I needed nutrition. They deemed the NG tube to have failed but kept it in place “just in case”. Excellent. Now on the Surgical ward in another side room with its own private bathroom and shower; score! I will spend the next 16 days here – preparing and recovering from surgery – before being discharged. That afternoon, I have a surgeon come along and place my PICC line. A PICC line ­- peripherally inserted central catheter – is inserted into one of the large veins near the bend of the elbow. It delivers medications and feed directly into the circulatory system, avoiding the digestive system all together. This would give my bowels complete rest until they would wake up after surgery. At this point, I was 90% sure I was going to agree to the surgery. I knew I couldn’t live like I was – in constant pain, living with no appetite and needing the toilet constantly – and if I ‘needed the bag’ so be it. Don’t take this as me being flippant but I knew the sooner I could wrap my head around this news and accept it as my “new normal” the easier my recovery would be, mentally as well as physically. Having a PICC line placed is a weird procedure. My upper left arm was frozen in order for the surgeon to gain access to my larger veins in my arm, and under ultrasound he guided the catheter up the selected vein in my arm, across my clavicle and down into my heart. He attached a double lumen – as I needed both TPN and medication access – and secured the line in with a pressure dressing. I would have my PICC line for two weeks and I loved how well it made me feel. 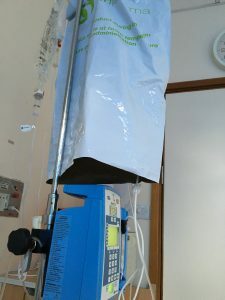 My first TPN bag started the following evening – my line position needed to be checked via a chest x-ray – and lasted 24hrs. Each bag is enough feed for 24hrs and they start the rate slow and build you up. I would have TPN leading up to and after my surgery, a total of ten days. Though I missed food – both taste wise and I weirdly missed chewing too – I got used to my TPN and was surprised at how much it did to make me feel better. It stopped me from feeling so sick and I got abit of energy back. Enough to ask tons of questions to the stoma nurse who visited me to explain about stoma care. I’d spent some of my ‘free time’ researching about living with an ileostomy. She provided me with a pack of pre-op information and encouraged me to try on the fake stoma and practice stoma bag. I did, firstly because I was seriously curious what it would feel like to have something stuck to my abdomen 24/7 forever and secondly if anyone would notice it under my clothes. It was a weird sensation to begin with but without a working stoma and the bag filling with waste, I knew it wasn’t real. But the ‘best’ part was when my visitors that evening didn’t notice until almost the end I was trialing the bag. Medically, I knew I would eventually need this surgery, there was no two ways about it. Was now the right time? The surgical team assured me at rounds that I needed a week or so of TPN before they would operate but obviously would reassess daily to see if I had deteriorated and if necessary move the date of surgery forward. There was space on the emergency list for the following Tuesday or Wednesday to do the surgery. I had the weekend to rest and let the TPN work. I’d spent the past three days passing more and more blood with every BM. I knew my colon was failing big time now, they would operate today.